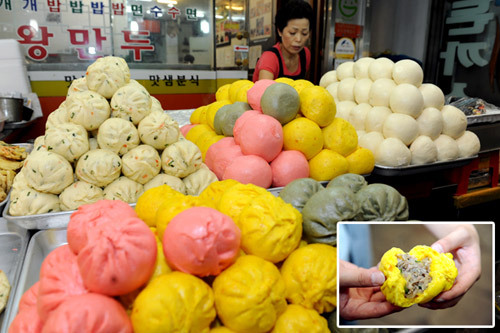 The Sinpo Market in Incheon and its many well-known restaurants tempt travelers with a variety of delicious treats including dakgangjeong, or honey-drenched fried chicken with hot sauce, and colorful mandu, or dumplings. 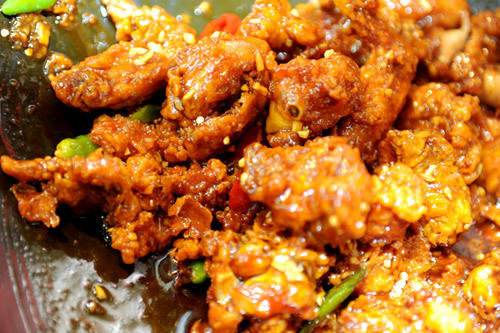 The red color of dakgangjeong, which has served as a signature dish in the market for 27 years with its garnish of chopped pepper and peanuts, is a mouth-watering sight. The first bite is spicy enough to bring a tear to people's eye, but it leaves a refreshing taste in the mouth that keeps them coming back for more. "The main reason this spot has become famous is the taste. I bet that people keep visiting here because the taste of the dish has been consistent for over 20 years," a local dakgangjeong restaurant owner said. Mandu, or dumplings made with thin dough and filled with meat or vegetables, are another signature dish. They come in different colors, and the filling gives even small portions a certain heaviness. One restaurant owner hails passersby with the promise that at his establishment the dough is colored not with pigment but with vegetables or fruit: cherry for the pink dough, mugwort for the green, and pumpkin for the yellow. A guest who bit into one of the dumplings remarked, "It is stuffed with so much, just one is likely to fill me up." The market is conveniently located for sightseeing. Near Incheon Station, there is a historical district with old buildings from the late 19th and early 20th centuries and the country's first Western-style park, Freedom Park. Chinatown is also not far. The best way to look around Incheon is to take the city tour bus. It offers three courses -- downtown, Incheon International Airport and Ganghwa Island. For the downtown and airport courses, it leaves Incheon Station at 10 a.m. every day but the Ganghwa Island course runs once on Saturday and Sunday only.